Most ThinPrep Pap tests are currently run in high-volume reference laboratories that employ automated imaging via the Hologic ThinPrep Imaging System. The ThinPrep Integrated Imager combines the power of ThinPrep computer-assisted imaging and the ease of dual slide review into a single, automated microscope, bringing increased sensitivity for cervical disease detection to laboratories of all sizes. "Approval of the ThinPrep Integrated Imager brings the benefits of ThinPrep automated Pap imaging to small- and mid-sized laboratories in the United States, and of course to their patients," said Tom West, president, Diagnostic Solutions division at Hologic. "Development of this newest ThinPrep product confirms Hologic's commitment to women's health and specifically to robust and accessible screening strategies for cervical cancer." The ThinPrep Integrated Imager guides cytology technicians to areas showing potential abnormal cells, and images slides in approximately 90 seconds. It combines an imaging station and review scope into a single desktop system offering high-quality optics and an easy-to-use interface to enable a convenient, flexible workflow. 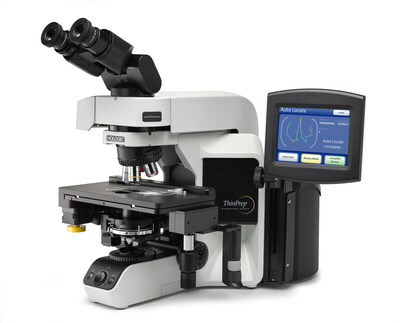 Also able to be used as a conventional microscope, the ThinPrep Integrated Imager consolidates the needs of the cytotechnologist into one device. In conjunction with the ThinPrep Integrated Imager, Hologic is also launching the Compass Stainer in the US. Already available internationally, the Compass Stainer is a smaller footprint automated stainer that can perform both routine and special staining protocols. The Compass Stainer is an affordable solution for lower volume laboratories that do not have the space for a larger, more expensive automated stainer. To learn more about ThinPrep Pap testing products available in the United States, please visit https://healthdxs.com/en/thinprep/. NIH Fact Sheets Home. Cervical Cancer. https://www.report.nih.gov/nihfactsheets/viewfactsheet.aspx?csid=76. Accessed April 10, 2018.